With the national mid-term election over in the United States, many students and faculty who invested in the democratic process of campaigns may be waking up and asking what additional ways exist for creating change in society. In 2012, the National Task Force on Civic Learning and Democratic Engagement called for academic institutions to dedicate renewed energy to community engagement, civic engagement, and service learning. Naim Kapucu (2014), a recent doctoral series lecturer here at Virginia Commonwealth University’s Wilder School, argues these community-based research (CBR) methods are both underutilized in public policy education and represent important ways for public administration scholars and students to gather wisdom and build skills needed to implement change beyond the walls of the classroom. In her 2010 dissertation, which surveyed faculty at NASPAA accredited schools about their participation in community-engaged research and teaching, Katrina Herndon Norvell suggested that socialization of aspiring academics is a key channel for increasing motivation to conduct community-based research later in a career. Community engagement and contributing to positive change in the surrounding community plays an integral role in the mission of the Center for Public Policy at the Wilder School, as well as VCU as a whole. As we’ve previously written, the CPP also involves students in a range of roles within different CPP units. For instance, the Performance Management Group (PMG), one of the units within the Center for Public Policy, specializes in consulting and organizational training programs that ensure the leaders in our workforce are effective, fair, and are suitable representatives of the organization’s mission and community. Two of the leadership development programs hosted by PMG are the Virginia Executive Institute and the Commonwealth Management Institute which both aim to inspire personal and organizational growth through leadership education and development. Similar to the Performance Management Group, the Grace E. Harris Leadership Institute (GEHLI) places their focus on leadership development and education for leading members within the community. One of their programs that they hold for a period of five months is the HIGHER Ground Women’s Leadership Development Program. The program equips women who are leaders in industries or agencies within the community with techniques that build self-confidence in their capacity to lead change for their various organizations. The program consists of a variety of workshops that discuss topics such as conflict management, communication, and team-building. By building a women-centric program, this gives the opportunity for women to learn essential leadership skills to not only benefit the future of their organizations, but gives them the opportunity to invest in their own futures. The Center for Urban and Regional Analysis (CURA) specializes in policy and program evaluation within the community, assessing the impact and implications of policy changes or economic revitalization strategies for specific communities. Recently CURA conducted studies to explore the economic impact of two local festivals, giving organizers a better understanding of how these events impact the local community. The Survey and Evaluation Research Laboratory (SERL), a provider of services such as focus groups, statistical analysis, and extensive surveys, serves community organizations by conducting and translating social, behavioral, and economic research to enrich the public policy discourse. One example of SERL’s impact in the Richmond community is a joint study with CURA, supporting the Office of the Virginia Attorney General’s “Project Safe Neighborhood,” initiative. SERL organized focus groups of residents in the Richmond area, particularly residents who live in areas where crime is more dense, and analyzed their responses to the question of where the source of criminal problems lie. By analyzing data from the members of the communities that are directly impacted, SERL’s analysis and presentation to the Communities and Public Safety Stakeholders’ Roundtable of the project contributed to a deeper understanding of the true nature of crime in the Richmond area. Our Office of Public Policy Outreach (OPPO) regularly conducts polls to better understand public opinion on a variety of policy issues (e.g. education, immigration, voting intentions, and school safety). Presenting our findings at community-oriented conferences, such as the recent Metropolitan Educational Research Consortium at VCU, and to policymakers, such as the Virginia House Education Committee, creates a more informed policy process. Author: The Office of Public Policy Outreach is part of the Center for Public Policy at Virginia Commonwealth University’s L. Douglas Wilder School of Government and Public Affairs. 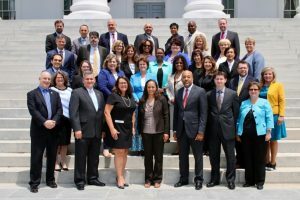 The office prepares VCU faculty for effective interactions with state and local lawmakers and helps generate and translate academic knowledge into successful public policies for the commonwealth.